My hometown has been the center of attention for the last week or so. As it pertains to major league baseball that is. I'm not typically a sports fan. Mostly a fair-weather cat. That's how Glogirly and Gloman are, so by default that is how I must be. We've got this baseball team here, the Minnesota Twins. They were doing pretty good, beating up lots of other teams. Gloman has had their big games on the TV. He likes to watch the score. He likes to yell alot. Mostly at the pitchers, umpires and coaches. Sometimes at the commentators and commercials. Sometimes I even think he's yelling at me. So last night was the big do or die game. The Twins versus the Yankees. I got my gear out just to get me in the spirit. Alas, the Twins lost. I can't help but think had they put a cat like me on the team they would have come out much better. I'm lightening quick and extremely coordinated. 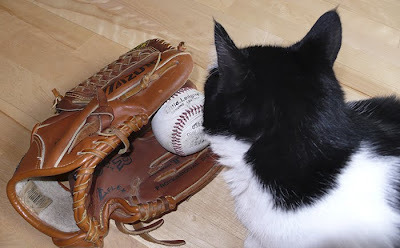 Although I have a hard time with the mitt, I can handle a ball like nobody's business. 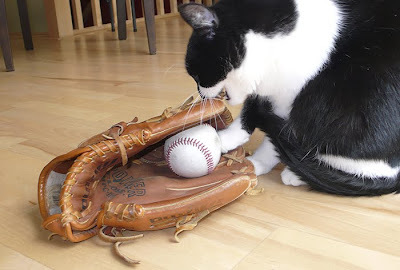 I can run like the wind and steal bases so quickly, all anyone would see is a flash of black and white fur. Most importantly, because I'm so good looking and photogenic, I'd make a great baseball card. Let's hope next season the Twins get their act together and consider adding me to the roster. MVC, a.k.a. Most Valuable Cat, that's me. And those are my thoughts on baseball. Take me out to your ballgame! I'd watch you play baseball, Katie. Other than that, ho-hum on sports. PS. You do look good with a baseball! Yep, my two Iowan boys were Minnesota Twins fans for years. Now the one lives in Chicago and he has changed to some Chicago White Soxs. And the other son in Maine is indifferent as he is tired of getting disappointed with any team. 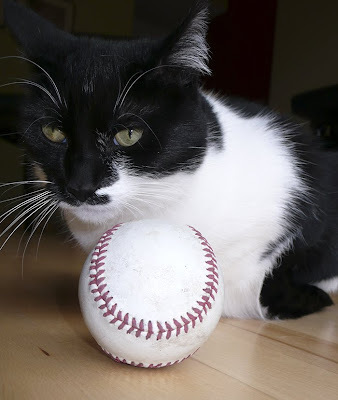 You look good with the baseaball. Yellow Kitty loves pin pong better. Wow, can't believe they didn't even consider you this year!!! The NERVE! Start training now, so next year you can just WOW them! Sorry your team lost, ours didn't even make the play~offs his year. We like the METS, but are embarrassed to admit that after this season! And, we want a baseball card of you! I'm sorry your team losted. We only watch football at our house. And there is lots of yelling, too! You have some good thoughts on baseball, Katie. 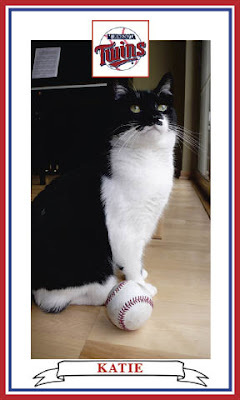 I think you would make a very good player and would look stunning on a baseball card. You are definitely MVC, Katie!!! We only watch college basketball here. The only balls I know about are of the hair variety. You make a great baseball card! That is awesome! You look so cute standng up in your chair. Looks like you're getting into it. Yes, they should have considered you for their team. You have lots of obvious talent! They better listen to your advice and assign you on the team. Plus we would love to see a flash of black and white fur on the telly. Not that we could watch these games over here that easily, but still, you know what we mean. 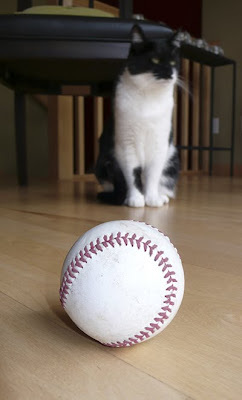 Well, your Minnesota Twins beat our Detroit Tigers and mom wasn't real happy about that...but we think watching you play with a ball would be more fun than watching those humans play...and better yet...we'll join you and we'll all have fun! YOU would be the superstar of the team! Momma spends all day on Sundays watching this odd shaped ball being thrown around. She normally sits there and doesn't say anything, except once in awhile she gets really animated and scares us. 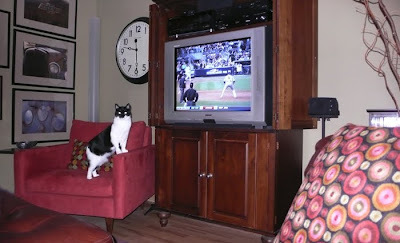 We think something BIG and IMPAWTANT is happening but she is hoopin and hollerin at the TV with that funny shaped ball. WE don't get it at all. I know baseball isn't like the football but the one thing the moms and dads do is to yell at the television. I don't get it? Does that help your tream to win more games? Hope next year the team will take you on and you can help out in some way. You make a lovely card Katie. I am guarding my good food, thanks for your support. oh..how cute was that! Came over from Larrys, glad I did!